How Diet Can Give You Healthy And Long Hair? Long, shiny and healthy hair can easily make you center of attraction so we try to put extra attention towards the care of our hair. While choosing the right hair care products for hair growth and best health we often ignore our diet chart but the choice of foods can make a huge difference in the health of hair. Let us find out how a healthy diet can lead to healthy hair? As for Vitamins B6, B9 and B12 are important for the creation of red blood cells that help in transporting the nutrients and oxygen throughout the body including scalp so to ensure the healthy supply of oxygen and essential nutrients, it is important to have a sufficient supply of red blood cells for which Vitamin B play an integral part. 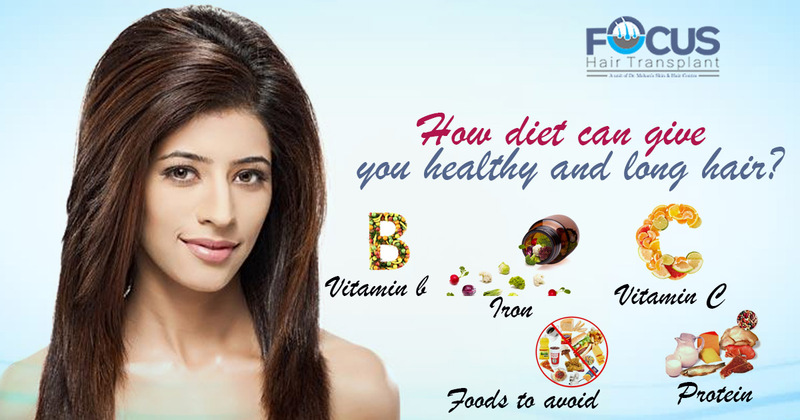 Thus adding the food enriched with Vitamin B can help us to have healthy hair. So for Vitamin B, you can add potatoes, oatmeal, beans, carrots, avocados, and strawberries in your diet chart. Even the medications that are used for Hair fall treatment also contain content of vitamin B. Iron is also an essential element for blood cells and if the level of iron will not be sufficient then the supply of oxygen can get hamper as a result of which hair fall can occur. Zinc is also a crucial element for good hair health as it helps in building up the hair protein and proper hair growth so you must add the foods that contain iron and zinc. Foods like beans, green vegetables, and whole grains contain the iron and the foods like cashews, pecans, peanut butter, mushrooms, and seeds contain sufficient amount of zinc so all these food items can be added as a hair loss treatment for your hair and even for their proper and healthy growth. We generally start taking vitamin C when the cold comes along but this vitamin is also beneficial for hair follicles as this vitamin helps the iron in the supply of oxygen by producing the red blood cells. Even Vitamin C is helpful in forming collagen which is very essential for the hair follicles to stay healthy and strong so it will be beneficial to have the foods that are enriched with vitamin C like oranges, grapes, pineapple, bell peppers, and tomatoes etc. Protein is essential for the building up of hair follicles and fatty acid is essential for the production of red blood cells and supply of oxygen and nutrients so you must add food items like dairy products that contain a high level of protein in your diet for good growth of your hair. There are the number of foods that can affect the health of your hair adversely like food that contains much sugar. The higher level of sugar can spike the blood sugar as a result of which insulin and androgen production can also get hampered. Androgen is the hormone that can become the reason for the shrinking of hair follicles and ultimately for fall of them so you must cut down the intake of sugar for good overall health and good hair health.